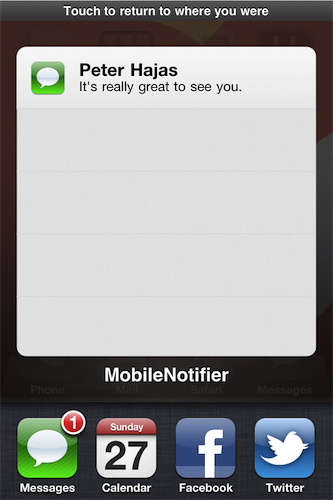 iOS notifications get in the way, interrupt one’s workflow or media consumption and once they’re gone, they’re gone. I believe people don’t like notifications on iOS because they need action, and quickly. What I would like to see in iOS 5 is a smart notification system that doesn’t stand in your way, yet it’s entirely accessible from the statusbar or the multitasking tray at any time. Developer Peter Hajas has apparently been listening to the complaints of people like me, and has released a new tweak available in Cydia that completely re-imagines the iOS notification system by providing an interface that's unobtrusive and, at the same time, allows you take control over your incoming notifications. MobileNotifier (this is the name of the tweak) displays notifications in a bar under the iOS statusbar which allows you to quickly jump to an app, and yet doesn't force you to stop scrolling the Springboard, for example. Hajas has also taken advantage of the empty space usually assigned to the multitasking tray: instead of displaying a transparent overlay for your Springboard when you double-click the home button, an "alert dashboard" with a list of all your notifications will appear. You can take action on them, or dismiss them. 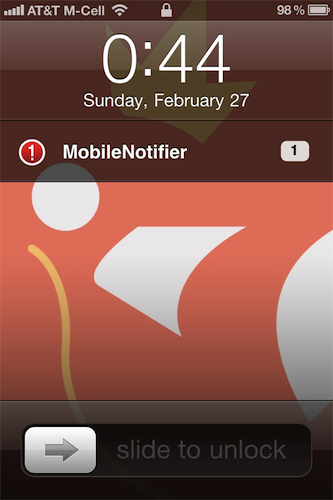 Similarly, MobileNotifier also brings notifications to the lockscreen -- something we've been wishing Apple would implement in iOS for years. I can't comment on the stability and speed of the tweak as I haven't installed it yet, but it looks really good. Check out more screenshots below, and the notes from the developer at his personal blog. You can download the tweak from Cydia by adding this repo: http://phajas.xen.prgmr.com/repo.